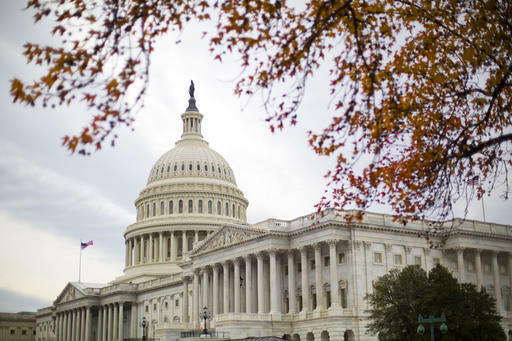 Hours to a government shutdown, coal-state Senate Democrats blocked swift action on a stopgap spending bill over benefits for retired miners and pressed President-elect Donald Trump, a self-proclaimed coal champion, to intervene with Republicans. The House on Thursday easily approved the must-pass bill that would keep the government operating beyond Friday’s midnight deadline and through April 28. The vote was 326-96. But the bill stalled in the Senate as Democrats facing re-election in 2018, including West Virginia’s Joe Manchin, Sherrod Brown of Ohio and Bob Casey of Pennsylvania, fought for a one-year extension for the miners’ health benefits rather than the temporary, four-month fix in the bill. Trump won those three states last month with heavy support from working-class voters in coal and steel communities. Challenging another coal-state lawmaker — Majority Leader Mitch McConnell of Kentucky. — Democrats said their fight on behalf of miners was a matter of fairness, upholding a 1946 guarantee by President Harry S. Truman to provide miners lifetime health and retirement benefits. Manchin called the GOP proposal to temporarily extend health care benefits for about 16,500 retired union coal miners “horrendous” and “inhumane” and accused lawmakers of turning their backs on people who built the country and made it great. While Democrats do not want to shut down the government, they’re willing to do so to protect the miners, Manchin said. “You’ve got to stand for something or surely to God you’ll stand for nothing,” he said. Democrats called on Trump to uphold a campaign promise to help coal miners by persuading Republican leaders to adopt a broader bill that would protect health care and pension benefits for the next decade. The Republican-controlled Senate Finance Committee approved the $3 billion bill in September, but the measure has stalled in the full Senate. “Who’s for the working people? Where’s Donald Trump on miners?” asked Sen. Claire McCaskill, D-Mo, who also faces re-election in 2018. “Republicans are bragging about the kind of support they have from workers in coal country … and now are prepared to just extend their health care for (four) months,” said White House Press Secretary Josh Earnest. Missing in action on the latest fight were two Republicans — Ohio’s Rob Portman and Pat Toomey of Pennsylvania — who had backed the broader bill when faced with tough re-election fights. Without mentioning their names, Democratic Sen. Bob Menendez of New Jersey referred to their absence now that the two had comfortably returned to the Senate. “Members who were running for re-election got to go home and say … ‘we’ll take care of it when we come back after the elections.’ Well, here we are,” he said on the Senate floor. Aides to Portman and Toomey did not return repeated calls for comment. McConnell and other GOP leaders are wary of bailing out unionized workers, with some arguing that all coal miners should get the help. Some Republicans also say the bill could pressure Congress to offer similar help to other cash-strapped pension funds. “They’re not going to get what they want. They ought to actually be grateful for what they got,” said Sen. John Cornyn of Texas, the No. 2 Republican. The dispute over the miners’ benefits was not the only one holding up action in the Senate as lawmakers sought to complete their work for the year. The House on Thursday cleared the government-funding bill and another bill authorizing hundreds of water projects, including measures to help Flint, Michigan, rid its water of poisonous lead, and one to allow more of California’s limited water resources to flow to Central Valley farmers hurt by the state’s lengthy drought. Sen. Barbara Boxer, D-Calif., vowed to filibuster the massive water projects bill, saying it favors corporate farmers over fishermen and endangered species. It appeared to be an uphill struggle, in part because her California colleague, Sen. Dianne Feinstein, favors the changes for the distribution of the state’s water resources. Democrats’ options are limited, especially since House members left for a three-week holiday and won’t consider changes to either bill. “If we can’t stand for working men and women in this country, we deserve what the American people think of us. We deserve the (low) ratings we get,” said Sen. Heidi Heitkamp, D-N.D., at a news conference with miners. Associated Press writers Andrew Taylor and Mary Clare Jalonick contributed to this report.